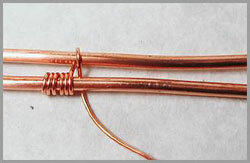 This tutorial teaches a few basic wire weaving techniques. 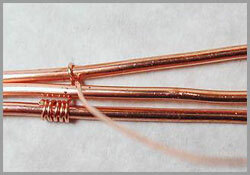 These techniques are very important to know when you first start weaving with wire. Most weaving projects you encounter will incorporate some form of at least one of these techniques. 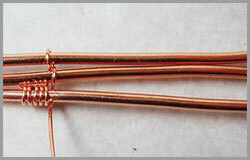 For this tutorial, I am using 16g wire for the frame wires and 26g wire for the weaving wire. I'm using these gauges to better show the detail in these weaves. 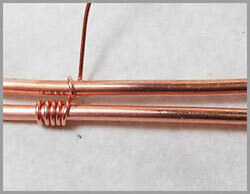 That is why this tutorial calls for those two gauges of wire. If you would prefer, you can use different gauges for your practice work. Just keep in mind that the weaving wire gage should be 8-10 numbers higher than the gage of the frame wire. 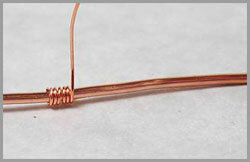 Wrap the 26g wire onto one of the 16g wires 4-5 times to secure the wire. Place the 2nd 16g wire next to the first. Bring the weaving wire underneath the 2nd wire. Then pull it up over the 2nd wire and back up underneath the first wire. Bring the weaving wire up over the 1st wire again, then back under the 2nd wire. Notice you will be weaving in a "figure 8" pattern. 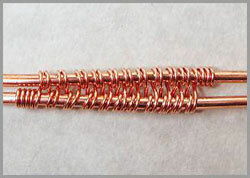 Continue weaving as in the previous steps until you have about 1-2" of wire left. Note: in some tutorials, you will be told to leave more than 2" of weaving wire at the end, depending on the type of project. 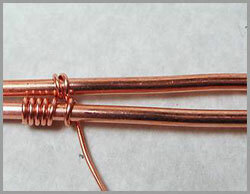 Secure the end of the weaving wire by wrapping it around one of the 16g wires a few times. Cut the weaving wire close to the 16g wire and press it flat with your flat nose pliers. 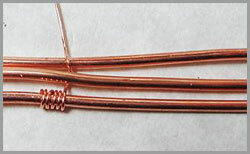 Wrap the 26g wire onto one of the 16g wires 4-5 times to secure the wire..
Place the 2nd 16g wire next to the 1st. Bring the weaving wire underneath the second wire. Pull the weaving wire up towards you. Place the 3rd wire next to the 2nd wire and push the weaving wire over the 3rd wire. 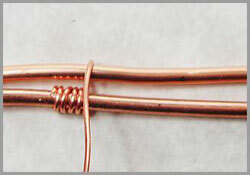 Bring the weaving wire around the bottom of the 3rd wire and up between the 2nd and 3rd wires. Pull the weaving wire down between the 1st and 2nd wires, then underneath the 1st wire. Continue weaving in the same over/under pattern. Finish off as in Step 5 of Weave 1. Note: You can add as many frame wires as you like and still weave in the same over/under pattern. Place the 2nd wire next to the first wire. Bring the weaving wire underneath the 2nd wire and wrap around it once. Pull the weaving wire down between the two wires, then underneath the 1st wire. Wrap around the 1st wire one time. 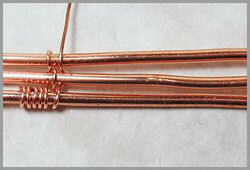 Note: Try wrapping the weaving wire around each frame wire more than once to achieve different results. Weaving around a curve. This is a combination of weaves 1 and 3. This technique helps to eliminate the unsightly gaps that occur when weaving around a curve. 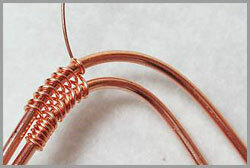 Begin weaving wire as in the first weaving technique in this tutorial. Continue weaving until you reach the beginning of the curve. 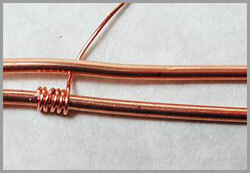 On the outside of the curve, wrap the weaving wire around the 16g wire 1x. Bring the weaving wire back down between the two wires. Pull it up from underneath the wire on the inside of the curve. Pull it back between the two wires, then up underneath the wire on the outside of the curve. Continue steps 2 and 3 until you reach the end of the curve. Finish weaving the straight area as in the first weave. 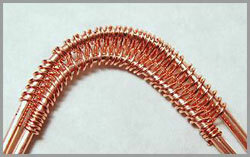 Note: If the curve is sharper than the one shown, or the wires are farther apart, you may need to wrap the weaving wire around the outer curve wire more than once between each weave to achieve the desired effect. 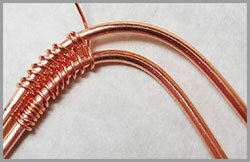 The weaves taught in this tutorial are the basis for most wire weaving projects. You will encounter many forms of these same basic weaves as you learn new techniques. Therefore, it is important for a beginning weaver to practice these few basic techniques. The Cross pendant shown to the left was created entirely with the first weave taught in this tutorial. 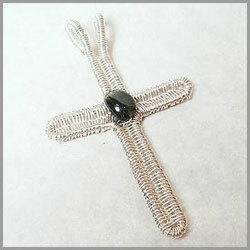 The Pendant below the cross was made using the first and fourth weaves in this tutorial. 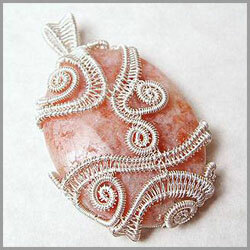 As you learn to make more projects with these basic wire weaving techniques, you will find many ways to combine and alter them to create many wonderful, one of a kind designs.